Robin Youngs, Edward Fisher,	The Journal of Laryngology & Otology, Volume 129 Issue 8, p 731. J C R Wormald, J M Fishman, S Juniat, N Tolley, M A Birchall,	The Journal of Laryngology & Otology, Volume 129 Issue 8, pp 732-739. I Khan, S Mohamad, S Ansari, A Iyer,	The Journal of Laryngology & Otology, Volume 129 Issue 8, pp 740-743. Y Ramakrishnan, R C Shields, M R Elbadawey, J A Wilson,	The Journal of Laryngology & Otology, Volume 129 Issue 8, pp 744-751. I P Tang, R L Carrau, B A Otto, D M Prevedello, P Kasemsiri, L Ditzel, J Muto, B Kapucu, C Kirsch,	The Journal of Laryngology & Otology, Volume 129 Issue 8, pp 752-761. F Alzoubi, H Odat, A Nuseir, A Al Omari, B Al-Zuraiqi,	The Journal of Laryngology & Otology, Volume 129 Issue 8, pp 762-766. V Atchariyasathian, K Pruegsanusak, S Wongsriwattanakul,	The Journal of Laryngology & Otology, Volume 129 Issue 8, pp 767-772. C Yvon, A Najuko-Mafemera, R Kanegaonkar,	The Journal of Laryngology & Otology, Volume 129 Issue 8, pp 773-778. N N Nwokoye, L O Egwari, O O Olubi,	The Journal of Laryngology & Otology, Volume 129 Issue 8, pp 779-783. C Sahin, H I Aras,	The Journal of Laryngology & Otology, Volume 129 Issue 8, pp 784-787. T-L Chow, C-Y Choi, S-H Lam,	The Journal of Laryngology & Otology, Volume 129 Issue 8, pp 788-794. M M C Yaneza, A Cameron, W A Clement, R Fairgrieve, M A Ledingham, M S Morrissey, J Simpson, D M Wynne, H Kubba,	The Journal of Laryngology & Otology, Volume 129 Issue 8, pp 795-800. M S Miah, P Spielmann, S J White, C Kennedy, N Kernohan, R E Mountain, R Cassasola, S Mahendran,	The Journal of Laryngology & Otology, Volume 129 Issue 8, pp 801-806. M Bannister, K W Ah-See,	The Journal of Laryngology & Otology, Volume 129 Issue 8, pp 807-811. K Nomura, H Hidaka, Y Takata, Y Katori,	The Journal of Laryngology & Otology, Volume 129 Issue 8, pp 812-816. R Brar, A Vijendren, M Salam, G Picken,	The Journal of Laryngology & Otology, Volume 129 Issue 8, pp 817-819. 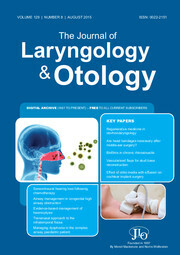 S Ojha, J Setlur, G Bunting, C J Hartnick,	The Journal of Laryngology & Otology, Volume 129 Issue 8, pp 820-824.